GIVE A LITTLE TIME - MAKE A BIG DIFFERENCE! 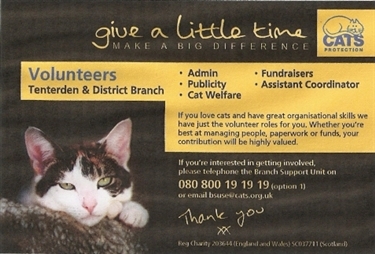 Tenterden & District Branch of Cats Protection are currently looking for new volunteers, particularly with administrative and website skills, to join our small but dedicated band who rescue and rehome cats in our area (Tenterden, Ashford, Romney Marsh and surrounding villages). Although we often recruit new volunteers, circumstances and their lives change and so we also lose valued colleagues as their availability decreases. If you have some time to spare, love cats and feel you would like to join us, you would be welcomed and given all the support and training you need.